New Delhi: The promoter-owned entity that buys and holds completed commercial assets of India’s largest developer, DLF Ltd, will look to raise $1.5 billion (Rs7,005 crore) through a Singapore listing of its real estate investment trust, or Reit. According to a company official who didn’t want to be named, DLF Assets Ltd, or DAL, is expected to file in January for a listing of DLF Office Trust, as the Reit arm is known. Citigroup Inc. is one of the advisers for the listing, which is expected to take place in the fourth quarter of the current fiscal by March. This is the second attempt to list the Reit in Singapore. In 2007, DLF had intended to raise $1 billion from a Reit listing in the city-state, but the plan was put off because of choppy market conditions. Meanwhile, in a filing with the Bombay Stock Exchange, DLF has said a meeting of the company’s board will be held on Tuesday to consider the integration of DAL with DLF. The company is looking at integrating a promoter-owned company, Caraf Builders and Constructions Pvt. Ltd, with DLF Cyber City Developers Ltd, which is a DLF subsidiary. Caraf is a holding company for the stake of the promoters K.P. Singh and family in DAL. This company will either be acquired by or merged with DLF Cyber City. “We are looking at a lot of options for the integration of DAL with DLF," said the DLF official. Caraf and DLF Cyber City are both lease rental firms of DLF, which develop and lease out commercial properties. 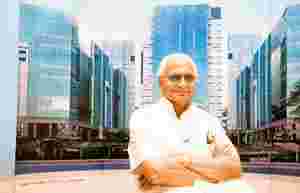 DLF promoters will subscribe to new shares issued by DLF Cyber City so that they get the rent generated by properties owned by Caraf, the official said. “I would give the integration of DAL with DLF a thumbs down because it would be negative for the minority shareholders of DLF," said an analyst with an international brokerage firm who did not want to be named. “We need to wait and watch for what happens at the board meeting, but it is likely to be a cashless transaction." DLF develops and sells commercial properties to DAL. Under an agreement, DLF has to deliver 13-14 million sq. ft of leased space to DAL, which also owes DLF around Rs2,500 crore as payment for the properties it had bought from the parent company. DAL typically used to contribute to 40% of DLF’s revenue till the December quarter of 2008. In the last few quarters, however, DAL has contributed less than 10% of DLF’s revenue. It is not clear whether DLF will continue to sell commercial assets to DAL after the merger. “If DAL becomes a subsidiary of DLF, it does not matter whether the entity buys from DLF," the analyst said.